The Vicktory dogs at Best Friends, indeed all pit-bull-type dogs everywhere, have lost a true ambassador. Ellen, one of the most affectionate dogs a visitor could hope to meet, passed away peacefully last weekend. At 11 years old, she was one of the oldest of the Vicktory dogs (seized from the property of NFL quarterback Michael Vick). The caregivers and medical team fought long and hard for Ellen, but in the end her health wouldn’t turn around. Some unknown disease was causing weight loss and muscle loss, as well as preventing her stomach from emptying. Despite a barrage of tests, the medical team couldn't determine the source of the problems. Her quality of life was no longer at an acceptable level. During her final two days, Ellen had a steady stream of visitors, all of them stopping over to say goodbye to this dog who was so easy to love. “I’ve never had a dog who was so affectionate,” says caregiver Maddie Haydon. One of Ellen’s nicknames, in fact, was Ellen Belly. Ellen’s favorite thing in the world was to flop over for belly rubs. As a close second favorite activity, she was extremely fond of handing out kisses by the dozen. “She bonded with everyone she met,” Maddie says. That’s an even greater accomplishment than you might think, considering that most of the time she was meeting people from a distance. Per court orders, the Vicktory dogs were not allowed to interact directly with Sanctuary visitors. Even though she couldn’t visit with them face to face, Ellen still left a lasting positive impression on those who came near her. One such person Ellen touched deeply was a local volunteer named Betty Grieb, who fell in love with Ellen instantly. Betty wasn’t about to let the fact that she couldn’t enter Ellen’s play area get in the way of anything. So, she spent more than three years reading to Ellen on the other side of the fence. “Ellen would go crazy whenever she heard Betty’s car pull up,” Maddie says. Last month, Ellen’s dream to meet visitors up close finally came true. 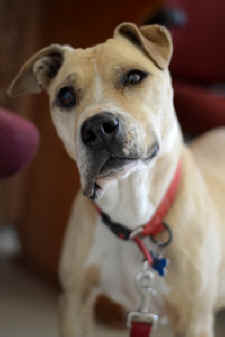 The red collar (staff-only) status was lifted for seven of the Vicktory dogs, including Ellen. At last, she could greet visitors face to face. “She was in her glory,” Tom says. When visitors stopped by, she loved nothing more than to march right into their midst and hand out kisses with unabashed enthusiasm. 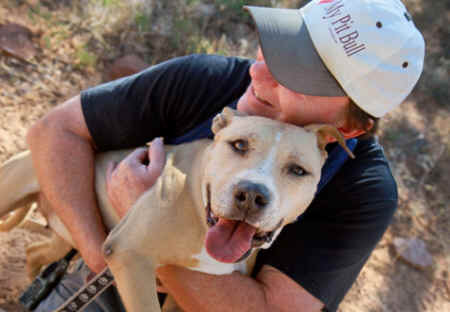 There was at least one volunteer, however, who already knew what a loving soul Ellen was. When Betty Grieb finally did get to greet Ellen right up close after so many years, it was definitely a moment to remember. “It was like a dream come true,” Betty says. Farewell, Ellen, and thanks for everything. You will be sorely missed.